Here I go with the coconut milk again. It’s just such a versatile ingredient; the more I use it in new and creative ways, the more I realize how many ideas I haven’t tried. Before the year is up, I definitely want to try it as the main ‘cream’ ingredient in a pumpkin pie as well – I’ll hopefully report back on that very soon. But I digress. Today I want to report on a dish that is so simple and yet so scrumptious that I have been craving it nearly every day since making it at least a couple of weeks ago. It was devoured so quickly that there are no pictures to show this time – but I hope to recreate it soon (seeing as I can’t stop thinking about it) and then update this post accordingly. It’s a baked rice pudding made with a purple jasmine rice blend – gorgeous, white and purple-streaked grains of long sweet rice. I found a box of it in my pantry that had been patiently waiting for literally over a year for me to come up with some fancy-pants way of incorporating it into a trendy Thai or fusion-inspired dish – another one of many shi-shi ingredients that I cart home with me from Whole Paycheck in a moment of inspiration and then stash in the cupboard for months on end until true inspiration strikes (coupled with energy and an actual recipe, preferably) and I dig it out and use it. Just as often, I have to report that such ingredients languish even longer, and in some cases even go totally stale. I am not great at shopping for only the items I need for the coming week or month; something like purple jasmine rice pops out at me from a store shelf and I can’t just LEAVE it there. It’s way too gorgeous, and novel, and exciting. I simply must bring it home where I can look at it every time I open the cupboard door and feel that tingle of anticipation (ooh, right, I have purple rice! Maybe next week/month/year I’ll think of something to make with that…). This box of purple rice was part of my scenery for entirely too long. But THIS recipe has guaranteed that it will now be a regular staple in my home – complete with an actual recipe and the strong inclination to use it! Inspiration struck at a potluck party I went to in honor of a Will Allen Growing Power weekend that I was volunteering with in Denver last month, put on by Feed Denver and hosted by The Urban Farm – two wonderful and innovative urban farming education and training organizations. The weekend was a creative and inspirational gathering of committed activists, educators, farmers, permaculturists and more. I met amazing people and took part in the construction of a hoophouse from scratch; it was an empowering experience to see it rise from bare dirt and mud on a snowy weekend, going from a pile of fencing and lumber materials to a finished structure in just a few short hours. Anyway… the potluck. One of our volunteers brought along two pie plates filled with a lusciously dark purple, dense, chewy, creamy confection topped off with slices of apple. It looked like rice, but I couldn’t be sure of anything with that crazy color going on. No idea if it was sweet or savory until I put it in my mouth. And what a sweet surprise it was! It was all I could do to keep from gobbling way more than my fair share of the dish; I had to settle for pointing and rolling my eyes and gushing about how fabulous it was. Clearly I was not the only one who felt this way about the dish; both pie plates full of purple rice surprise were vaporized in short order and we were left staring wistfully at the crumbs, wondering what it was we’d just eaten and loved so much. Fast forward to a couple weeks ago when for some reason I came across a recipe for a savory coconut rice on 101 Cookbooks (which I will definitely have to try sometime soon) that used the same exact brand of purple jasmine rice blend that I have. As the lightbulb went off in my head, I started Googling more recipes for purple rice, and it hit me that THAT’S WHAT I HAD at that party! If I just add some eggs, and sugar, and bake it all in a pie dish… I scrambled to crank open my last two cans of coconut milk, mix up some eggs, and get this thing in the oven. And boy, was it worth it. Chewy, creamy, sweet, dense, sugary goodness. I CANNOT WAIT to make this again. Now mind you, I did not have pure purple rice, and the photos and recipes you will find online are for real purple rice. I had this lovely blend. I don’t know how much that affected the outcome of my particular experiment – but I do know that the color was not quite the deep, rich purple-black that you may see featured in other recipes. Suffice it to say that this works great with this blend, and quite likely with all manner of other rice blends or varieties. The purple just makes it extra exotic, if you ask me. But it may well make a difference in taste, so one of these days I will try it with the REAL purple rice. This, however, is damn good. Preheat the oven to 350 degrees. Add the drained rice and 2 cans of coconut milk to a pot on the stovetop, and bring to a boil with a dash of salt. Simmer for 25 minutes, stirring to keep from sticking. Remove from heat. Meanwhile, in a mixing bowl, cream the white sugar and butter together and add the eggs one at a time, beating as you go. Run the beater for 5 minutes, then stir the egg/sugar mixture into the cooled rice/milk mixture and mix well to combine. Coat a 9-inch deep dish pie plate (or other suitable baking dish) with cooking spray or butter and pour in the rice mixture. Sprinkle the top of the pudding evenly with the brown sugar. Bake at 350 degrees for 35-45 minutes or until done. For me, the pudding looked obviously done when the brown sugar on top had caramelized to a nice, sticky dark brown, and the pudding itself had set quite solidly. This dish ages very nicely overnight and makes for an immensely tasty breakfast, snack, or dessert the next day. Try to save some for at least that long. I did not in my case add any sliced apples, but it sounds like a perfectly lovely idea and I’ll try to think of it next time. A final note on my own version of this dessert is that my backyard eggs, wth their super-orange yolks, have a tendency to turn things really weird colors. The brownish-purple hue that this pudding took on just after I mixed the coconut milk/rice mixture with the egg/sugar mixture was not, shall we say, appetizing or particularly photogenic. Never you mind about this, if it happens to happen to you. You won’t give a damn when you are shoving the end result in your face late at night in the privacy of your own home. I imagine that using REAL purple rice, instead of a partially white blend, might also cover up this eggy color and make it a non-issue. This is the ultimate in comfort food though – not much to look at, but unforgettably delicious in that warm, filling, god-I-hope-there’s-more kind of way. Now if you’ll excuse me, I’ve got to go out and buy more purple rice and coconut milk. It was well past the first or even the second frost when I dug up 5 pounds of fresh carrots from my garden. I forked them out of the ground on a warm day when the soil in my raised beds was nice and soft, and they came out juicy and plump, ready to be eaten straight up or added to something wonderful in the kitchen. 5 pounds is a lot of carrots. There are even more out there in the ground; when I had filled a bowl, I had to stop and hope the rest would hold for another day. We did what we could to polish them off: sliced them into a tangy Asian sauce with water chestnuts, corn, peas and other veggies; ate them straight up; chopped and roasted them with potatoes and brussel sprouts; diced them into a hearty lentil soup; and at least 2 pounds of them ended up in this creamy, sweet, tropical soup. Most carrot soups are either a simple, ginger-carrot puree (a delicious combination), or a less exciting, but incredibly comforting, cream and carrot soup (vaguely French, I suppose). Something or other had gotten me thinking about making a carrot soup with coconut milk instead of cream. I wasn’t sure where to start so I fished around for ideas on the internet, got a general picture of where I was going with this, and went to work. The earthy, garden-fresh carrots were to die for, of course. Fresh ginger added the spicy counterpoint that is so beloved in most carrot soups, and 2 generous cans of rich, creamy coconut milk gave it a luxurious texture and a tropical note that delivered an element of sweet surprise to the palate. I wish I could have made even more (though I was able to use a LOT of carrots) – it’s all gone now, and I would give anything to have a container stashed in the freezer someplace. I’m already craving it again. I apologize for the terrible photo, but as I was boxing up the last morsel of this soup for lunch, it finally occurred to me to take a picture! Saute the onions, carrots and ginger with the curry powder until the vegetables are translucent and beginning to soften. Add the vegetable broth and cook for at least 25 minutes, until carrots are soft. 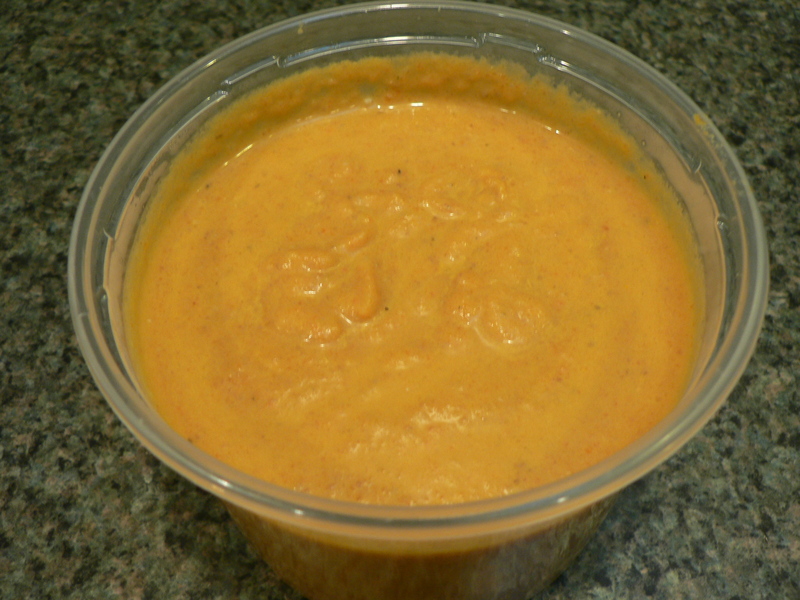 Allow to cool slightly, then puree in a food processor or blender, working in batches. Better yet, if you have a handheld immersion blender, you can puree it in the pot. Return soup to pot and turn the heat back on. Stir in 2 cans of coconut milk until the soup has completely reheated and is well combined. This soup could be served hot or cold. It was deliciously warming in winter, but I suspect the bright notes of ginger and the tropical hint of coconut would make it a fine, light summer soup as well, even chilled. As a bonus, this recipe is fully vegan, yet lusciously creamy. It’s hard to stop after just one bowl.